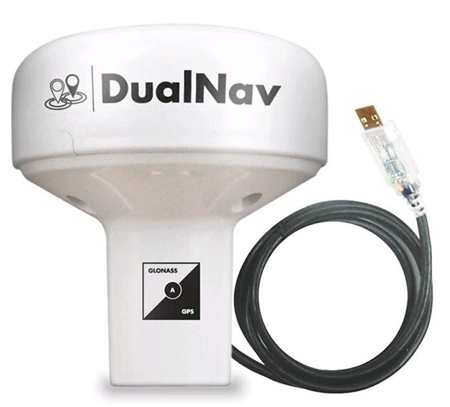 DualNav technology offers unprecedented positioning accuracy with GPS and GLONASS from this USB smart antenna. The GPS150USB DualNav positioning sensor combines a super accurate 50 channel GPS with GLONASS, the Russian funded satellite positioning system that is now online and providing an excellent backup or alternative to GPS. This smart sensor will automatically switch between the systems or the user can manually select the most appropriate for their activity. In DualNav mode, a sophisticated algorithm combines GPS and GLONASS data to offer sub 1m accuracy. It's designed to connect to a PC or MAC (an even LINUX system) via a USB connection. It also derives power via the USB cable so it's completely self-contained an ideal for use on charter boats with a notebook PC charting system. The GPS150USB will also be able to utilise the European funded Galileo positioning system when it comes online (IOC Initial Operation Capability in 2018). Digital Yacht's GPS150USB utilises the industry standard NMEA data format and the USB connection creates a virtual COM port on the PC or MAC which is easily usable by all common marine charting programs such as MaxSea, SmarterTrack, SeaPro, Rosepoint, Nobeltec, Maptech, Expedition, Imray etc.